Welcome to our guide to the CavaPooChon. 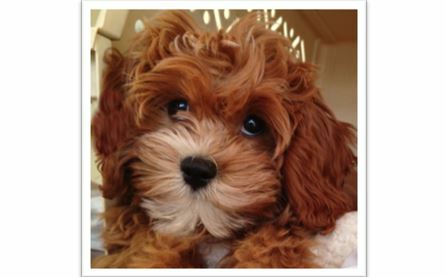 The Cavapoochon is a designer breed crossing three dogs – the Cavalier King Charles Spaniel, Bichon Frise and Toy Poodle. 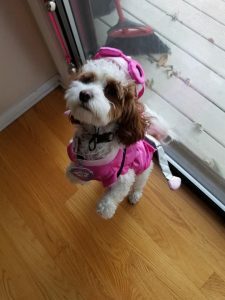 Readers interested in this page may also be interested in our guide to the Cavachon or Cavapoo. 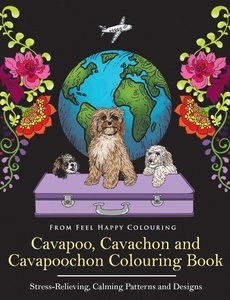 Enjoy hours of fun and escapism at a great price with this bestselling Cavapoo, Cavachon and Cavapoochon colouring book designed with adults, teenagers and kids aged 10+ in mind. Who doesn’t like travel?! Who doesn’t like Cavapoochons?! Our lovable dogs are about to go on a vacation/holiday of a lifetime to iconic tourist destinations around the globe – and the best part is that you get to go with them too! People of all ages who have bought our books love them and we are sure you will too. They make ideal gifts for friends and family for times like Christmas and birthdays. Steve and Linda Rogers of Timshell Farm reveal to us how they started to breed the CavaPoochon. This delightful triple-cross, the Cava POO Chon, was first conceived and developed in 2001 by Steve and Linda Rogers, owners of Timshell Farm. 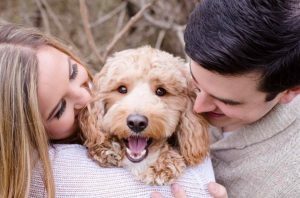 The Rogers worked with a reproductive specialist vet in Carrollton, Texas to formulate a special blend using the finest purebred lines of Cavalier, Toy Poodle and Bichon Frise. The Rogers were the third breeder of Cavachons on the internet. 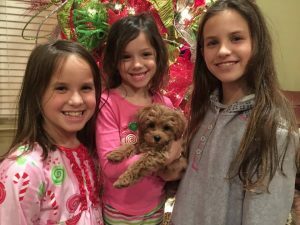 They founded the CavaPooChon triple-crossbreed for families wanting smaller puppies, with coats that would work for both severe allergies and asthma. 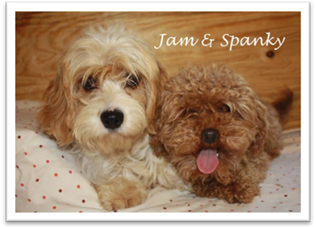 Jam is a Blenheim Cavachon mother (50 percent Cavalier and 50 percent Bichon Frise) and next to her is Spanky, Timshell’s red, color-bred, Toy Poodle. Spanky has been the sire to three of Jam’s litters, as well as several other females. Lucky dog! Timshell puppies have parent dogs cleared for genetic faults with gentler energy levels – no “issues” whatsoever! Three Timshell puppies appeared on The Today Show in November 2013 and their story was told in an AP news report that went world-wide! Many appear on Instagram if you look for “CavaPooChon”. CavaPooChons are sought out by families that want a smaller dog than the Cavachon, and most importantly, those families that require a coat with the very least amount of shedding for severe allergies and asthma sufferers (these people could not tolerate a Cavachon, in most cases). Thanks a lot for this wonderful interview and for sharing the lovely photos of your CavaPooChon. Watch how the CavaPooChon loves to run and jump in the video below. What are the history and origins of the CavaPooChon? The cavachon breed was introduced around 1996 and quickly became a favorite mix and won the hearts of many that swear by this mix as the best! When breeding a mix that is half and half of a shedding breed, you can’t be 100% that the offspring will be non shed, so breeding back to a poodle make this mix an F1b a non-shed favorite and has been a big hit for the past 10 years and gaining in popularity quickly! We are one of the first breeders in the US to produce this wonderful tri mix. What colors of CavaPooChon are most popular? Red with white markings is the most popular color but they can be these colors as well: Red, Apricot, Cream, Black/Tan/White, Black, Black and White, Sable, Black and Tan and White/Apricot, White/Red similar to the blenheim coloring in the cavaliers. We are also seeing a few chocolate colors as well as merle colors coming but are rare. What does the CavaPooChon look like? They look like puppies almost their whole lives. They have a very soft curly coat that is non shed if bred properly. they have large expressive eyes, wide head and muzzle with a stocky build and friendly wagging tail! What are the pros/cons of the CavaPooChon breed? Cavapoos love everyone! They have the gentle and clownish nature of the cavalier and the intelligence of the poodle and also non shed from the bichon and poodle. Bichons are Poodles are so smart and loving, it’s just perfection all in one TRI Mix! While they train easy, some can take longer if they are toy sized because of their small bladders. Also some health issues can be an issue so make sure your breeder does annual heart exams as well as OFA (Orthopedic Foundation for Animals) certifications on their parent dogs for cardiac, patella, eyes and hips. An added bonus would be dna genetic panel testing to rule out being a carrier for diseases such as degenerative myelopathy or Progressive Retinal Atrophy. Grooming can be an issue and expense but it is a great trade off for low to non shedding coats! Overall they might just be the perfect family dog!! 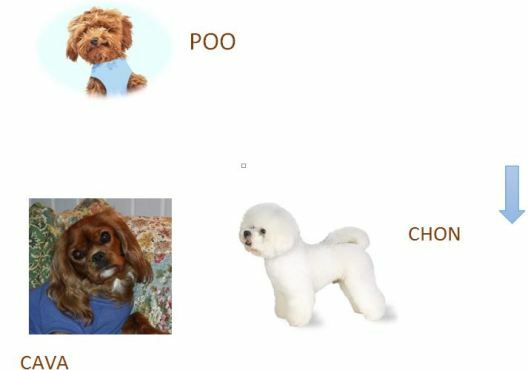 What can a new owner expect in terms of differences between the CavaPooChon and other breeds? New owners will find the cavapoochon will bond very quickly with their family and will do very well with routine and positive reward training and praise. They are small and easy to train and usually are not a destructive breed or have large exercise requirements. They make a great apartment dog also. The DogExperts.info website aims to ask questions to breeders, vets and experienced owners to get the answers to your most frequently asked questions about the CavaPooChon breed of dog. You can also help too! We would love to feature your dog and publish any photos or pictures of your CavaPooChon you would like to email us. We also have a Facebook page – come like us and get involved with fellow owners – click here to go to our Facebook page. What type of owners buy a CavaPooChon? Are you glad you choose to buy a CavaPooChon and not another breed? How would you describe the CavaPooChon temperament? What advice might you give to people thinking about whether they should buy a CavaPooChon over other breeds? What type of typical personality does the CavaPooChon have? Is it possible to describe a fairly typical CavaPooChon? What is the breed standard/description for the CavaPooChon? Are there any downsides to owning a CavaPooChon that prospective owners should be aware of? Is the CavaPooChon breed of dog suitable for first-time dog owners? Some breeds can be described as greedy and prone to weight issues, would this apply to the CavaPooChon? Is the CavaPooChon breed suitable for a person or family that are out at work all day? Some owners seek a breed suitable for barking and offering a guard dog role – how does the CavaPooChon match up to that role? Are there myths about the CavaPooChon – in other words do new potential owners come to you with misconceptions about this breed? What types of questions do you get once owners get their CavaPooChon home? What is the typical temperament of a CavaPooChon, so people know what to expect from their new pet? When fully grown how much on average does a CavaPooChon weigh? When the CavaPooChon is full grown in size what is the maximum height and length expected to be? Is the CavaPooChon ever crossed or mixed with other breeds of dog? Does the CavaPooChon smell or drool a lot? Do you have a CavaPooChon growth chart? What breed group does the CavaPooChon come under? Are there some types of people that you can suggest the CavaPooChon is not suitable for, perhaps families? How is the CavaPooChon with children? Do you think the CavaPooChon is suitable for families with young children? How does the CavaPooChon get along with other (existing) pets and do you have any tips or advice for new CavaPooChon owners in terms of successful integration? Is it better to buy one CavaPooChon or two? Would the CavaPooChon be suitable as a guard dog? Can I leave my CavaPooChon during the day while I go to work? What is the expected average lifespan of the CavaPooChon? In terms of life expectancy, how long on average would the CavaPooChon breed live to? How to handle the CavaPooChon puppy to start off – how much food, what type, how often? Do owners need to consider supplements for their CavaPooChon? How much did your CavaPooChon cost to buy? Can you offer advice to people looking to buy a CavaPooChon and how much should they spend? What advice would you offer new CavaPooChon owners? What types of people are buying the CavaPooChon and why? Where can I buy CavaPooChon rescue dogs or find a CavaPooChon for adoption? Please note that buying or searching for a ‘cheap’ CavaPooChon can be false economy as they may have health issues that cost you far more in the long-term – always buy from a good and responsible breeder! How would you describe the CavaPooChon puppy to potential new owners? What types of owners are best suited to owning a CavaPooChon? What inspired you to become a breeder and did you start with the CavaPooChon? 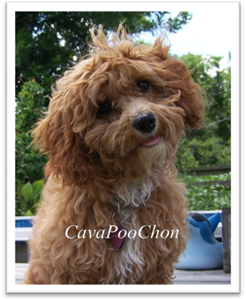 As a CavaPooChon breed expert, are there any ‘essential’ tips you would like to share with new owners? 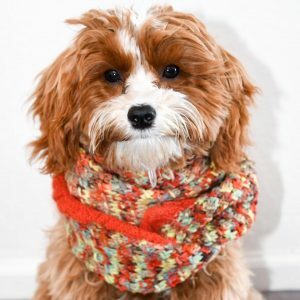 How long does it take to housetrain/potty train a CavaPooChon? We invite you to email us your CavaPooChon’s pictures, in particular we are looking for photos showing CavaPooChon puppies at 1, 2, 3, 4, 5, 6, 7, 8, 9, 10, 11 and 12 weeks old as well as early pictures such as 1, 2, 3, 4, 5, 6, 7, 8, 9, 10 and 11 months old to a year old. Do they have any nicknames or does the CavaPooChon have popular names? If my CavaPooChon is pregnant what might the litter size be? Could the CavaPooChon be dangerous around young children? How do you prevent a CavaPooChon biting? How do you prevent a CavaPooChon chewing? How do you stop a CavaPooChon jumping up? Does the CavaPooChon have an issue with excessive digging? Why does my CavaPooChon keep growling and barking? Is there a reason my CavaPooChon dog is often scratching excessively? In comparison perhaps to other breeds what can you say about the CavaPooChon and their exercise needs and do you have any tips or advice for new CavaPooChon owners? As a breeder of the CavaPooChon , do you prefer a collar or harness? As an expert of the CavaPooChon breed do you prefer a standard leash or retractable? Can you offer any dog walking tips for CavaPooChon owners? What games and toys can you recommend for the CavaPooChon? How intelligent is the CavaPooChon compared to other dog breeds? Do you have any special grooming routines or tips and advice for new CavaPooChon owners? What accessories are required to be purchased for grooming a CavaPooChon? How much do CavaPooChon shed and how do I maintain their hair and how often? Is the CavaPooChon a hypoallergenic breed? Any advice/tips you can give concerning cleaning and bathing your CavaPooChon? Can you offer new CavaPooChon owners advice concerning fleas and maybe products you use in treatment and prevention? What advice and tips could you offer to owners who might wish to follow your path in showing the CavaPooChon? What started your interest in showing the CavaPooChon? If a new owner perhaps wanted to meet other owners or find out more – perhaps they have an interest in joining a local club or maybe they wonder how they can start showing their CavaPooChon – where would they begin? How would an owner know they have a show-quality CavaPooChon and how would they start off? What official organisations are there for the new CavaPooChon owner and what benefits or services do they provide? In buying a CavaPooChon, can you offer advice and tips to new owners? How did you progress to becoming a breeder and why focus on breeding the CavaPooChon out of all the breeds you could have chosen? What do you think makes the CavaPooChon special to you? In comparison perhaps to other breeds what is it like to train a CavaPooChon and do you have any tips or advice for new CavaPooChon owners? How should new owners approach bringing a new CavaPooChon home, any advice and tips you can give? Should I allow my CavaPooChon to sleep in my bed or elsewhere in the house? Should my CavaPooChon sleep in a kennel or crate? Health is always a major concern when buying a dog, do you have any advice for new CavaPooChon owners to be aware of in particular? What is the recommended schedule for vaccinations for your CavaPooChon? What type of health issues can a CavaPooChon have and how do you deal with preventing these? Why does my CavaPooChon have diarrhea? Why is my CavaPooChon vomiting and do I go to the vets? 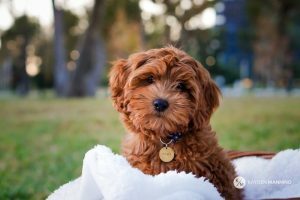 When should I take my CavaPooChon for vaccinations and which ones do they need and how often? How often will my CavaPooChon be in heat? Should I consider getting my CavaPooChon spayed or neutered and when and how much does this cost and what are the benefits? 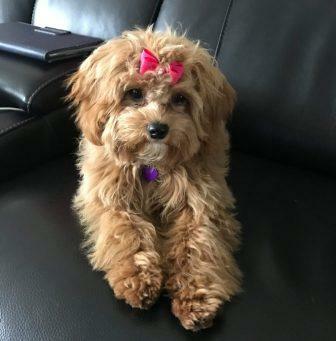 My CavaPooChon is limping, what should I do and should I go to a veterinarian surgeon? Why is my CavaPooChon not eating? How much does it cost to insure my CavaPooChon? What healthcare issues or diseases might be excluded from companies that provide CavaPooChon dog health insurance? What age would you class as an ‘older or senior’ CavaPooChon? What changes in food and diet would you suggest making for an older CavaPooChon? Do you feed any supplements to an older CavaPooChon – or anything else which helps them as they age? Are there any health issues particular to a senior CavaPooChon dog? Do you have any advice for owners of an older/senior CavaPooChon or tips you can pass on?